Knowledge sharing & experience capitalization on how to use the AGORA platform to access an outstanding digital library collection in the fields of food, agriculture, environmental science and related social sciences. 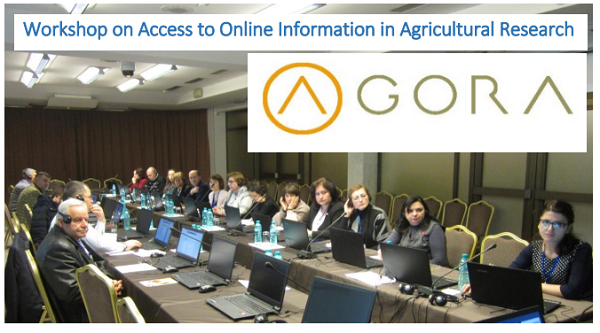 In November 2017 the AGORA team of the Food and Agriculture Organization of the United Nations (FAO) held a national workshop on Access to Online Information in Agricultural Research in Chisinau, Republic of Moldova. The main objective of this workshop was to raise awareness of key trends in scientific publishing in agriculture, fisheries and forestry and enhancing access, and of the use of resources available on the AGORA platform. The goal of AGORA as one of the five Research4Life programmes is to reduce the knowledge gap between high-income countries and low- and middle-income countries by providing affordable access to scientific research in the area of agriculture. Currently, the AGORA provides access to up to 8,200 Journals and 22,870 Books in the area of agriculture and related sciences. To date, AGORA has more than 3,300 institutions from more than 115 countries registered. AGORA is designed to enhance the scholarship of the many thousands of students, faculty and researchers in agriculture and life sciences in the developing world. AGORA is one of the five programmes that make up Research4Life: AGORA, HINARI, OARE, ARDI and GOALI*. *the fifth Research4Life programme will be launched early 2018. Librarians, from universities and research institutes, from all over the country. The Workshop had also attendants from the Moldovan Ministry of Agriculture and different university faculties (including information technology departments) and campuses. Approximately 45 participants from 25 national institutions attended this event. What are the Hinari, OARE, ARDI and AGORA programmes? Who can access Research4Life? How does registration and accessing Research4Life programmes work? As a user, what can I do? Outreach and training material. How can I access AGORA? How do you access current information in your field? Other topics related to information literacy and access to global online research in agriculture in Europe and Central Asia were also discussed. All participants have strengthen their information literacy skills on the use of AGORA resources in agriculture and related domains. All the AGORA official contacts from the participant institutions were updated. The AGORA helpdesk is open to all the participants providing them with further information on how to better access and use AGORA contents and fixing technical issues. AGORA received new registrations from eligible institutions. AGORA in the Republic of Moldova DGroup was created for all participants of the workshops. The DGroup is a mailing list that connects the workshop participants and aims to share news and updates about AGORA. This workshop was funded by the Research4Life Capacity Development Team and by FAO. Logistics were handled by the FAO Office in the Republic of Moldova.